This chart exemplifies how fast things can come undone when a fiat currency starts to lose traction in the markets. Confidence. That is the mortar that holds together all fiat systems. There is nothing else behind them. And confidence can be fleeting and fickle thing, especially in emerging markets. If you’re watching Argentina’s economy, it hasn’t been a banner week. 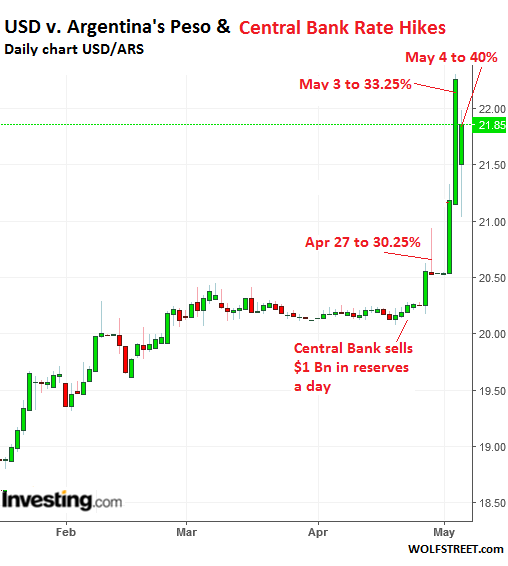 This week, Argentina had to raise its key interest rate three times to keep the Argentine peso from losing even more value against the dollar. Three interest rate hikes in one week is a lot – it implies the first two didn’t work, and the Central Bank is not in control. The interest rate currently sits at 40%. That means the Central Bank pays 40% per year on peso-denominated debt, which can imply that they expect the value of the peso to fall somewhere in the ballpark of 40% over a one year period. A year ago in April, the rate was closer to 26%. Yikes. And the exchange rate kicked off the week at around 20.5 ARS/USD. It jumped almost to 23 ARS/USD, and is currently hovering around 21.8 ARS/USD. This bout of currency instability was triggered by a generally bad week for emerging markets, then compounded by a tax on foreigners holding local currency short term debt instruments (LEBAC) coming into force. Emerging markets, and their currencies across the board, suffered due to a strong dollar. This relationship exists because a stronger US dollar raises fears in investors that emerging markets will be unable to repay dollar denominated debt. And right now people feel like Argentina’s government may not have control over the peso. As silly as it may seem, people feeling like an economy is in trouble can be enough to spur a crisis regardless of underlying realities. Interest rates as high as 40% mean that inflation isn’t going anywhere for a while, either. That being said, and while I expect a great amount of pontificating from market commentators and expert economists with beards, the reality is that if any of them actually knew what was going to happen they’d be putting their money behind that position rather than ranting against economic ideologies or heads of state.